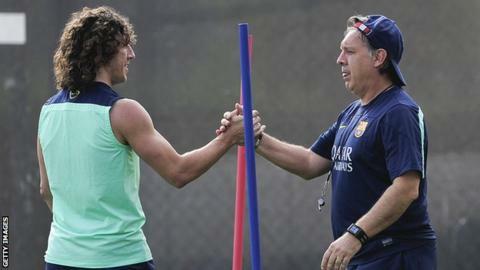 Barcelona's players are behind coach Gerardo Martino "to the death", insists club captain Carles Puyol. Argentine boss Martino, 51, has faced criticism after Saturday's shock loss at lowly Granada left Barca's Spanish title hopes in tatters. The defeat followed their Champions League quarter-final exit against La Liga leaders Atletico Madrid. "I don't think there needs to be a revolution depending on the results," said Spain defender Puyol. "You have to have a working method, not just according to whether you win one or two trophies. "The team is hungry, it wants to win and keep making history." Former Newell's Old Boys boss Martino was appointed last summer as successor to Tito Vilanova, who stepped down to focus on his treatment for cancer. Under Martino, the Catalan club's hopes of retaining their La Liga crown appear slim, with his side down in third place with five games remaining. Atletico are four points clear of Barca, who also trail second-placed Real Madrid by a point. But Martino still has the opportunity to win one piece of silverware in his maiden season, as Barca face bitter rivals Real in Wednesday's Copa del Rey final in Valencia. "We have a final ahead of us - one of the best possible games - and I want to assure the fans that we will be giving everything in the game," said 36-year-old Puyol, who announced last month that he will leave the Nou Camp at the end of the season. "If we are all united then it will be easier. The only way forward is to stay together."